These 8 quart galvanized metal bucket are hot dipped and incredibly tough. A reinforced wire rim, offset base, and sturdy handle ensure that these buckets can be used for decades on end. They are rust resistant and watertight for use in any conditions. Store horse grooming supplies, pick a garden of tomatoes, water your german shepherd, or carry feed. You can even create charming outdoor storage for dog toys or tennis balls with these galvanized steel buckets. 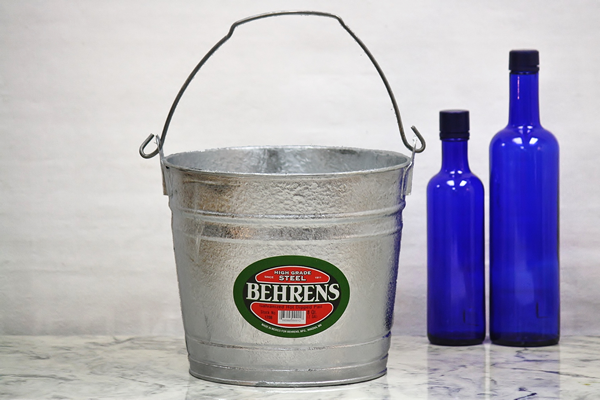 We also offer this galvanized bucket in 10 quart, 12 quart, and 14 quart sizes. See the smooth finish 8 quart galvanized steel bucket here. This is the perfect size to hold berries in! It's big enough to carry plenty and small enough that the berries at the bottom don't get mashed.